I wish you could fix the pattern links. When you click on the A-line dress you get the A-line jumper dress. A link to the A-line simple dress doesn’t exist. I have a question about the actual size of the pattern (the picture you see). For example the A-line jumber – it says on the left side the length of the dress should be 4,25″. Should i enlarge the picture till it’s 4,25″ or should i print out normally and lengthen the dress till it’s the right length? Because if you enlarge the picture the whole dress is going to be larger. So i’m not sure what is meant exactly. Lorraine, the pattern needs to be printed out at the right size, so if you print it and the line doesn’t measure 4.25″, you’ll need to fix it. Usually printing it with page scaling set to “none” does the trick. If you just lengthen the one side the pattern will not fit. That line with 4.25″ on it is your printing guide so that you know the pattern is printed at the right size when you measure it and it’s exact. Sorry for my late reply 😀 I think i’m going to try and set the page scaling and see if that helps. I don’t know what it was on before..i hope it helps!! Well now i know that that line is important LOL. Thanks a lot for your help!! Hope it works! 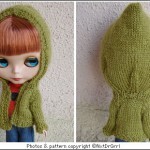 The Blythe t-shirt pattern works well for Strawberina, too. Strawberinas are about the size of a Lati Yellow SP. Can somebody send a letter to Takara. Telling them to make Retro Mana Encore! I had people telling me They bought two and they had cracks. Hopefully someone can pass this on to the creators. And put her in simpler box for God sake. Hi, I’m not sure where to ask so I’ll ask here, I got my Blythe Orange and Spice, and after a few hours of having here underwear on her legs are already stained! Do anyone know how to remove leg/arm stains? Should I make shorts to cover up the stains + prevent more or is there a way to remove and prevent? i have the same problem! my orange and spice arrived yesterday and has a stain on her arm from her coat. now im going to have to send her back to japan at my own expense (Â£20) for a replacement 🙁 did you figure out a way to sort it? I just made new underwear to stop the legs staining further and I’m thinking about bathing her. thank you so much for these patterns. you are so very generous to share them! i am not a fan of blythe, but i have other dolls that they will fit well! i appreciate these patterns, and you, more than you know!! thanks for being one of the “good guys” left in the world!! I think you can bathe the dolls. And if you can’t bathe their heads then at least you must be able to bathe just their body. I’m going to try this hopefully it works! A lot of useful information here. Iâ€™m sending it to a few friends and also sharing in myspace. And naturally, thanks for your great writing! Love the patterns! Thanks for a great site. SÃ³lo veo un patrÃ³n. Â¿No hay mÃ¡s?